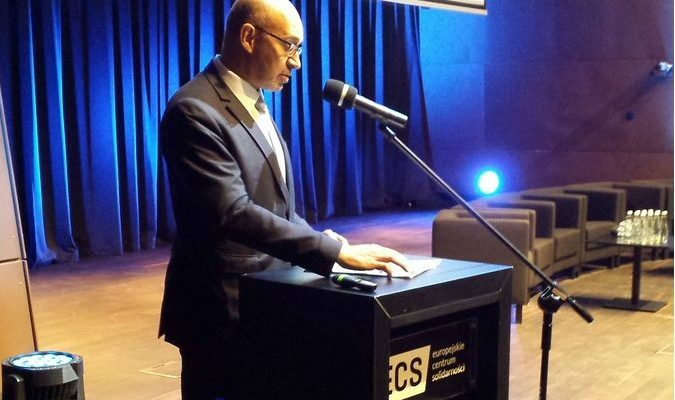 This is the keynote speech given by Harlem Désir, Representative on Freedom of the Media for the Organization for Security and Co-operation in Europe (OSCE), at the conference “Free European Media” which took place in Gdansk, 15-16 February 2018. It is a great pleasure for me to be back in Gdansk, a free city since centuries, and to have the opportunity to speak with you on media freedom, pluralism and democracy. 37 years ago, in August 1980, just here the workers at the Gdansk shipyard began a strike through which they imposed the recognition of Solidarność as their independent trade union. The shockwave of their courage swept through Europe and made the first cracks in the Berlin Wall. Yes, that’s where modern and unified Europe begins. From the first day of their strike, the Gdansk shipyard workers advanced demands for workers’ rights and material improvements together with demands for freedom of speech and on freedom of the media. Here in Gdansk, shipbuilders were builders of democracy. The transition would take decades and is, as everywhere, an ongoing process, never ending. Adam Michnik once said that the worst thing about communism is what comes after it. It was a joke, and the achievements of democracy in Poland ​after the fall of communism are impressive. But it was not only a joke, it was also a wake-up call which reminds us that nothing can be taken for granted. Michnik claims that “in some post-communist countries, the often brutally greedy new elites are slow to learn democratic habits, respect for the law of the land, pluralism or tolerance.” This warning can be applied to many countries and not just to post-communist states. What we are witnessing in many places today is a combination of populism, illiberal democracy and corrupt oligarchy trying to reverse democratic conquests, to bypass the rule of law and to stifle free media. We are living a time of paradox for freedom of the media. On the one hand, the Internet offers an unprecedented potential for freedom of expression, access to information and pluralism. But at the same time the social media have become, in a few years, the space of a new tide of hate speech, disinformation, fake news and online threats including against journalists. Populist and authoritarian movements have turned the open space of internet upside down against diversity and respect for freedom. What was particularly remarkable in the third point of the demands of the Gdansk workers was the principle of pluralism. This was not a movement or a revolution that claimed a new definitive truth against the previous one, but freedom of speech and access to media for all. It was not about replacing a single red truth by a single truth of a different colour, with the same intolerance or authoritarian logic and designing the opponent as enemy of the people. We know who comes next in the list. The journalists, because by nature they are critics, are always accused by populists of being the enemies of the people. That’s the logic of all populists ; to oppose their democratic legitimacy based on the support of the majority to the democratic rights of the others. In the name of the majority they kill democracy. We have to fight for the principle of pluralism in front of the rise of populism. That’s why your meeting today is so important. The principle of pluralism means that you accept that you will not impose your truth. You can defend it but it will be discussed as well as your action if you hold some kind of power in society. The principle of pluralism means that we believe that ultimately the interest of the whole society will be best served by the discussion of different views; that the duty of each and every one is to ensure that all the others will always be in a position to express and publish their ideas even if you disagree with them. It is the famous sentence attributed to Voltaire. “ I disapprove of what you say, but I will defend to the death your right to say it”. This principle means that we think that we are more able and intelligent together than alone, or following one person or one party’s view. That’s why protecting free, independent, critical and pluralistic media is key for democracy. Not to speak about the indispensable role of the press to ensure government accountability, to fight against corruption and to guarantee free electoral competition. That’s why all the attacks that we are witnessing against the press today are grave attacks against democracy itself. In order to silence dissenting voices, the methods used may vary from verbal attacks to harassment and violence. Economic fraud is a widely used instrument in some countries. In Russia the independent newspaper Novaya Gazeta has endured countless fiscal audits in recent years. Accusations of crime and even terrorism are another tool, notably in Turkey, against the journalists of Cumhuriyet and so many others. We have also seen, in Hungary and in Poland, the economic pressure on independent newspapers such as Népszabadság and Gazeta Wyborcza by cutting state advertisements. Attempts to limit access for journalists to information are another tool to stop them from holding the government to account. In Poland, only widespread protests could lift a ban on access of journalists to the national parliament, in December 2016. In Hungary, a new law will, if adopted, limit access to a broad zone around the national borders; the law may well handicap the media in their role to report on migrants and refugees, an important issue of general interest. I would raise a second paradox of information in the digital age, which is that while billions of citizens have the means to express themselves individually online, this does not automatically mean that we have pluralism of sources of information. Our information feeds are controlled by algorithms designed by very few actors. We are immersed in information bubbles. They echo our own views and opinions, instead of challenging them. The third paradox is that we are also witnessing the risk of erosion of pluralism of the press and the media themselves. The digitization of information accelerates the concentration of advertisement revenues and media ownership. The situation becomes critical and pluralism is at an unacceptable risk level in countries with a combination of high media concentration and strong political interference. In that context I would like to insist on 4 key priorities for media freedom. The first one is the safety of journalists which is still at risk in many countries even democratic ones. The fight against impunity is essential. If intimidation and threats against journalists remain unpunished, violence and even killing can be the next step. Before she was murdered last year, Daphne Caruana Galizia in Malta received countless threats. Three people have been arrested in the investigation on the car bomb that killed her, but the mastermind must be brought to justice. Her son Matthew is here with us. Tomorrow, you will be able to hear from him first-hand how threats turn into horrific reality. The second priority is to ensure the protection of media freedom in the new context of the fight against terrorism and hate speech. Too often, restrictions to media freedom and imprisonment of journalists are justified using security motives. Vague and baseless accusations of support for terrorism are used to arrest and prosecute journalists. More than 170 journalists are jailed in the OSCE region. The same apply to restrictions imposed on the Internet. We fully understand the need to combat terrorism and hate speech but we must ensure that it is not at the detriment of freedom of speech and freedom of the media as a whole. The third priority is to address the important issues of disinformation, “fake news,” and propaganda. Disinformation misleads citizens, spreads mistrust and undermines democracies. But censorship is not the answer – more quality journalism is, more investigative journalism, more debunking of fake news and more media literacy. My fourth priority is the topic of this first panel debate today, to promote media pluralism through the dissemination of best policy practices in the increasingly digital media landscape. In my mandate to defend media freedom in the 57 Participating States of the OSCE, I already had to intervene in more than more 120 cases in more than 30 countries, since my appointment in July last year. In Poland my predecessor and I had to intervene several times recently, as the Polish media landscape is under pressure. In 2015, the government changed the broadcasting law and now controls the appointments of higher management of the public broadcasters and of the National Broadcasting Council. As a consequence, many journalists have been fired. My predecessor, Dunja Mijatovic, made a very strong statement on this issue, highlighting that the independence of public broadcasters and the independence of regulatory boards are essential safeguards for a free and pluralistic media landscape. Last autumn, I intervened on the case of journalist Tomas Piatek, who was accused, because of his book about the defence minister, of “insulting a constitutional body”. I raised the issue of T.V.N. which was fined 400.000 euros for reporting on a demonstration in front of Parliament. Two weeks ago, I had to raise the issue of new legislation which criminalises the discussion on historical events linked to the Second World War. I raised my concern that criminalization of how one describes historical events would be in violation of international obligations that Poland has adhered to, on freedom of expression, and that it’s of utmost importance to preserve freedom of research and publication for academics and historians even on sensitive historical issues. More than ever, we all need free and pluralistic media, the daily bread of democracy. They offer the platform where all voices can be heard on challenges in society, on different interests and demands and on options for solutions. That’s why we need a strong coalition in the defence of media freedom and pluralism, and this conference is an important step in building this coalition. For this reason, I thank the European Federation of Journalists for putting pluralism so high on the agenda today, and I am looking forward to the recommendations that you will adopt. Picture credit: Ricardo Gutiérrez (EFJ).